Closure of "What did and did not Cause Collapse of WTC Twin Towers in New York"
"What did and did not cause Collapse of WTC Twin Towers in New York on 911"
and final Comments by Anders Björkman M.Sc. There was no investigation of 9/11. Indeed, the White House resisted any inquiry at all for one year despite the insistent demands from the 9/11 families. NIST did not investigate anything. NIST simply constructed a computer model that was consistent with the government's story. The 9/11 Commission simply sat and listened to the government's explanation and wrote it down. These are not investigations. The below Closure has been published in Journal of Engineering Mechanics, July 2010 as a reply to the Anders Björkman discussion paper published at the same time. It can also be down loaded as pdf. The authors Zdenek P. Bažant, Jia-Liang Le, Frank R. Greening and David B. Benson think that skyscrapers collapse from top down as shown right, i.e. a weak top C can crush an intact, stronger bottom A by gravity alone. Closure to "What Did and Did Not Cause Collapse of World Trade Center Twin Towers in New York?" by Zdenek P. Bažant, Jia-Liang Le, Frank R. Greening, and David B. Benson, Journal of Engineering Mechanics, July, 2010. The discusser claims that no differential equations are required to model the collapse. This is incorrect. The intuitive guesses emanating from his disconnected quantitative estimates prove nothing. Although the discusser uses some mechanics terms such as velocity and acceleration, nothing can be deduced without actually formulating and solving the equations of motion. If the discusser rejects the differential equation form of the equations of motion based on a smeared continuum approximation, he could be credible only if he formulated and solved discrete equations of motion. [A one-dimensional model - a line getting shorter/denser - described by a differential equation - cannot describe a 3-D structural damage model where the bottom part is 100X stronger than the top part]. The discusser claims that the progressive collapse model we developed in the paper does not consider the energy required to compress the rubble. This claim is absurd. [No, it isn't! As described below, there is no energy available to produce structural defects, ejection of parts, etc. No structure can collapse from top down due to rubble] He apparently overlooked that this energy is included in parameter g of Eq. (11). On p. 898 of the discussed paper it is stated that, aside from the energy of comminution, parameter g includes "the energy of plastic fracturing deformations of floor trusses with their connections and of horizontal steel beams connecting the perimeter columns, the energy dissipated by inelastic deformation and friction of colliding fragments [How to calculate friction energy of colliding fragments?? ], the energy of crushing the equipment, drywalls, perimeter walls, furniture, piping, etc." The overall energy balance is ensured by deriving the differential equations of motion from an energy potential [see Eqs. (25)-(30) of Bažant and Verdure 2007]. The necessity of gravitydriven progressive collapse is demonstrated by the fact that the kinetic energy of impact on each floor far exceeds the energy absorption capability of the underlying columns [Eq. (3) in Bažant and Zhou 2002]. [Well, it would be nice to demonstrate a gravity driven collapse in a laboratory! Do it and win €1M]. The discusser further claims that, for the continuation of the crush-down phase, the columns in the part C (upper part) must be assumed to be in contact with the columns of part A (lower part). This claim is erroneous. During the crush-down collapse, part C and part B (compacted layer) are moving together as a whole while part A is being crushed by the compacted layer B [schematically, see Fig. 2(b) of the paper]. The energy condition for the crush-down phase to continue is given by Eq. (6) of Bažant and Verdure (2007) (and the gravity driven crush-down is actually guaranteed to occur by Eq. (3) in Bažant and Zhou 2002). [So Eq. (3) is simply wrong]. Based on the profile of the rubble pile shown in Fig. 3(b) of the paper, the discusser estimates the rubble density to have an unrealistic value (3.075 t/m³). Since this figure is only schematic [? it is very accurate], his point is meaningless. Besides, he ignores the fact that much of the rubble (characterized by mass shedding coefficient k_out = 0.2 in the paper) has been ejected during the crush-down [?? So first the rubble is compacted and then it is ejected ... and your 1-D differential equation considers it? LOL] and that the tall and narrow pile as sketched exists only for a split second just before the moment at which layer B hits the ground. At that moment, the pile immediately begins to spread rapidly outside the tower footprint. If one assumes the rubble pile density to remain constant during spreading, a simple calculation shows the rubble to spread about 60 m outside the tower footprint. This gives for the rubble pile a slope of about 20°, which agrees well with the typical slope of rubble piles [any references?] seen in the demolitions of buildings. Bažant, Z. P., and Le, J.-L. (2008). "Closure to 'Mechanics of progressive collapse: Learning from World Trade Center and building demolitions' by Zden?k P. Bažant and Mathieu Verdure." J. Eng. Mech., 134(10), 917-923. Bažant, Z. P., and Verdure, M. (2007). "Mechanics of progressive collapse: Learning from World Trade Center and building demolitions." J. Eng. Mech., 133, 308-319. Bažant, Z. P., and Zhou, Y. (2002). "Why did the World Trade Center collapse? Simple analysis." J. Eng. Mech., 128(1), 2-6. The above Closure must be regarded as the most shameful Closure in structural damage analysis history! It is suggested that "[Björkman] presents no meaningful mechanics argument against the gravity driven progressive collapse model of our paper". Actually no composite structure or building of any kind can progressively collapse 'live on (faked) TV' into dust from top down to ground by gravity, i.e. a moving top part C (about 20 concrete floors separated by steel columns) dropping a short distance to start the process crushes from above (!) a lower, intact part A1 of identical structure into rubble/dust B that is 1/4 of A in height according to Bazant & Co and then B and C crushes A2, A3 and A4 into more B! This POUFF, POUFF theory is a joke! Top part C, weaker than bottom parts A1, A2, A3 and A4, cannot apply sufficient energy so that elements of parts A1-4 only are destroyed. Note further that A4 carries A3, A2, A1 and C prior collapse, i.e. 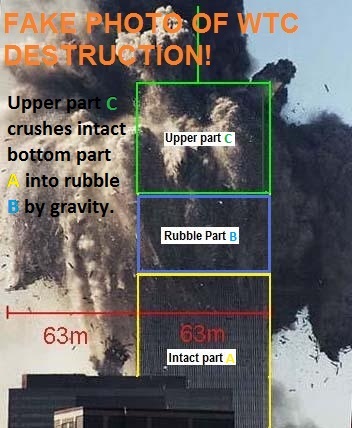 A4 is five times 'stronger' than C. Likewise A3 is four times stronger than C, A2 three times stronger than C and A1 twice as strong as C.
Bazant & Co however suggest that blocks A1, A2, A3 and A4, which each consists of abt 20 concrete floors separated by steel columns, are destroyed/pulverized, when the 20 floors of each block A1, A2, A3 and A4 are internally impacted, floor by floor, by gravity and intact top block C from above during the collapse and transformed into dust, B, later found on the ground - block C destroying itself at the end from bottom up ("Only gravity driven impact could have produced the concrete dust as found on the ground" - What Did and Did not Cause Collapse of WTC Twin Towers in New York - Zdenek P. Bazant, Jia-Liang Le, Frank R. Greening and David B. Benson, p 11 (2008)). It is terrible that Bazant & Co support terrorism by producing 28 pages of scientific, peer reviewed nonsense published in the ASCE Journal of Engineering Mechanics ASCE , Vol. 134 (2008). It is further suggested by Bazant & Co that "the discusser claims that the progressive collapse model we developed in the paper does not consider the energy required to compress the rubble. This claim is absurd." Absurd? So let's do an energy balance, when top part C has crushed 41.84 meters of stationary part A (density 0.25) and compressed it into 10.46 meters of rubble B (density 1) at the beginning of the 'gravity collapse' as described in ref. of my original discussion paper. Or as Bazant & Co say: "If the discusser rejects the differential equation form of the equations of motion based on a smeared continuum approximation, he could be credible only if he formulated and solved discrete equations of motion" and "The energy condition for the crush-down phase to continue is given by Eq. (6) of Bažant and Verdure (2007) (and the gravity driven crush-down is actually guaranteed to occur by Eq. (3) in Bažant and Zhou 2002)". OK, let's formulate and solve the discrete equation of motion of top part C and the energy associated with it. I have done it before! The 53 meters tall top part C of WTC1 has cross area 4 000 m² and volume 212 000 m3 and weighs 53 000 000 kgs according Bazant & Co (i.e. 1 000 tons per meter in the Bazant 1-D line model). Top part C actually consists of 1 000 000's of elements and joints but Bazant simplifies them to one line! Top part C drops down about 31.38 meters in about 3.00 seconds as recorded from (fake - animation!) videos. The top part C remains intact (sic) according Bazant & Co: only "the columns of part C get plastically squashed by only 1% of their original length and afterward the collapse proceeds in a one-way crush-down mode". Bazant & Co ignore 1.000.000's of weaker elements and joints that make up top part C! In reality top part C should be elastically deformed and seriously locally damaged at contact. Bazant & Co ignore the energy absorbed by top part C as elastic and plastic deformations. The drop corresponds to a loss of 53.000.000 x 31.38 x 9.82 kg m m/s² = 16.33 GJ of potential energy. If the top part C had fallen freely (no resistance) it would have had a velocity of 24.82 m/s after 3.00 seconds, because the kinetic energy of a block of 53 000 000 kgs at that speed is 16.33 GJ. However, the average velocity of top part C moving 31.38 meters in 3.00 seconds is 10.37 m/s, i.e. the actual velocity of C after 3.00 seconds is only about 20.74 m/s as observed from (faked) videos (animations! ), which corresponds to 11.40 GJ of kinetic energy (and 84% of expected free fall velocity after 3.00 seconds). Many observers point out that the acceleration, read gravity collapse, is constant without any initial and following jolts being observed, which is quite strange. How can energy be transmitted in multiple collisions = gravity collapse without visible retardation of the moving top part C? However, only 69.8% of the available potential energy has been converted into kinetic energy - top part C is accelerating - but not at 100% free fall acceleration. Had top part C had velocity 24.82 m/s after 3.00 seconds, it would apply no energy or force or pressure at all on lower part A (like WTC 7 for 2.25 seconds during its destruction)! According Bazant & Co remaining energy has gone into deforming elements and ripping apart joints in lower part A and compressing and accelerating 41.84 meters (or 41 840 000 kilograms) of stationary WTC1 lower part A at density 250 kgs/m3 into 10.46 meters of moving rubble B at density 1 000 kgs/m3 (the 31.38 meters drop of part C) to velocity 20.74 m/s. You do not need a differential equation of a 1-D model to calculate that! However "the compacted layer cannot be expected to be seen in the video record" according to Bazant & Co (sic)! So we are simply asked to believe that top part C, remaing intact (! ), in 3.00 seconds compresses/accelerates 41.84 meters of upper section of lower part A into a 10.46 meters rubble layer B that we cannot be expected to see! Are Bazant & Co serious? A weaker top part C destroying a stronger structure lower part A below ... and we cannot see it? 1. Top part C (mass 53 000 000 kg) moves down 31.38 meters crushing lower part A below and accelerates to and gets final velocity 20.74 m/s. Top part C is virtually undamaged and not deformed. "The compacted layer (part B) cannot be expected to be seen in the video record" according to Bazant & Co. Note - photo above is a fake from a stupid animation! Evidently no intact upper part C or compacted rubble part B can destroy lower, intact part A. C and B are just smoke/dust added by the animators! 2. Uppermost 41.84 meters of lower part A (mass 41 840 000 kg) becomes 10.46 meters of compressed rubble B (not seen!) that moves down 15.69 meters and also accelerates to and gets velocity 20.74 m/s. 3. After 3.00 seconds of lower part A collapsing due to gravity, top part C and rubble B - rubble B not visible (sic) - with combined mass 94.840.000 kg have velocity 20.74 m/s that corresponds to 20.4 GJ of kinetic energy as per Bazant & Co: "During the crush-down collapse, part C and part B (compacted layer) are moving together as a whole, while part A is being crushed by the compacted layer B [schematically, see Fig. 2(b) of the paper]". 4. The potential energy applied to (lost in) the process is top part C moving down 31.38 meters and 41.84 meters of lower part A crushed down 15.69 meters (53 000 000 x 31.38 + 41 840 000 x 15.69) x 9.82 = 22.8 GJ, which means that only 22.8 - 20.4 = 2.4 GJ of energy is used to compress 41.840.000 kg of lower part A into rubble B or 2 400 000 000/41 840 000 = 57.4 J/kg or 57 kJ/ton or 0.016 kWh/ton WTC 1 structure. In fact - applying 0.016 kWh of energy on one ton of any material/structure steel/concrete during say 3 seconds would not produce much effect at all. Just some elastic deformations and local damages at contact points. Easy to verify in any laboratory or university or material testing company. But acording to Bazant & Co: "...aside from the energy of comminution, parameter g includes "the energy of plastic fracturing deformations of floor trusses with their connections and of horizontal steel beams connecting the perimeter columns, the energy dissipated by inelastic deformation and friction of colliding fragments, the energy of crushing the equipment, drywalls, perimeter walls, furniture, piping, etc."" Another energy balance can be done after 12 seconds (dynamic state) - when WTC 1 lower part A is completely crushed down into rubble B that impacts solid ground (that is not affected!) - just before crush-up. 5. Top part C (mass 53 000 000 kg) has then moved down 268 metres crushing part A below to abt 90 meters of rubble B in 12 seconds. As average velocity is 22.3 m/s, the final velocity is say 44.6 m/s or 61.5% of free fall velocity. 6. Complete 358 meters of lower part A (mass 358.000.000 kg) has become 90 meters of compressed rubble B (not seen due to smoke) that has moved down 134 meters. It has also velocity 44.6 m/s. 7. The potential energy applied to (lost in) the process is top C moving down 268 meters and 358 meters of part A crushed down 134 meters (53 000 000 x 268 + 358.000.000 x 134) x 9.82 = 610.6 GJ. The moving mass C + B with height 143 meters is 411.000.000 kg with velocity 44.6 m/s after 12 seconds corresponding to 407.8 GJ of kinetic energy (that is applied to the ground). It means that 202.8 GJ of energy was used to crush down 350.000.000 kg of lower part A into rubble B or 579 J/kg or 10 more than crushing the first 41.84 meters of part A. It is still much too little to crush anything. Thus a complete energy balance shows without doubt that WTC 1 was destroyed very quickly - 12 seconds according to videos of the collapse - with extra energy than potential energy applied from top added during destruction. Actually, any energy balance shows that no building of any kind can be crushed down from above (sic) by a little top piece of itself + gravity. The videos of the WTC1 collapse is simply a faked animation shown 'live on TV' to fool the viewers. 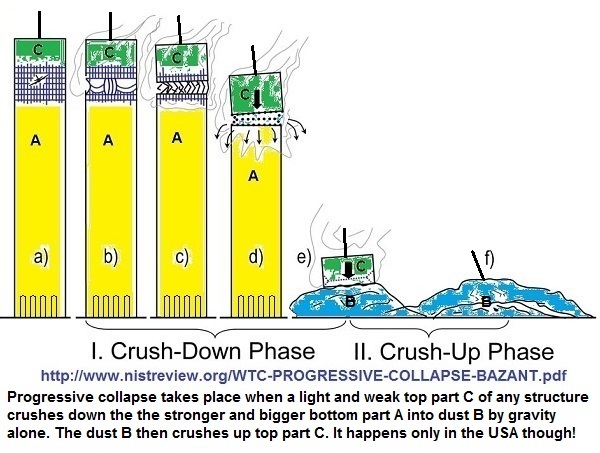 In reality WTC1 was destroyed or blow apart from bottom up using very strong conventional means. To shred a 1 000 kg car into pieces in a modern recycling plant may require 32 kWh energy, i.e. 200 to 2 000 times more energy! Bazant & Co suggest that extremely little energy is required to pulverize and compact steel/concrete lower part A into rubble B. They have no idea how much energy is required to break elements of steel or concrete. To suggest that 0.016 kWh/ton can initiate the destruction of the WTC 1 structure of steel/concrete is criminal. 11 storeys of WTC 1 destroyed in 3 seconds! 41.84 meters of lower part A, destroyed in 3 seconds, is about 11 storeys of WTC 1 each weighing about 3 700 tons consisting of 4 000 m² of a concrete floor held by >350 trusses connected via >700 bolted joints to 47 core and >240 perimeter columns. So only 3 700 x 0.016 = 59.2 kWh of energy is required to destroy one floor of WTC 1. Or it is suggested that the columns have spliced connections every 3 floors so to rip apart >2 100 bolted truss joints and >287 spliced columns joints are done by about 180 kWh applied in less than a second. It does not add up. To break bolted/spliced joints requires much more energy. Easy to verify in any laboratory! Many idiots belive that, if you drop a mass of steel shaped into long, delicate strands (such as a bird cage or the top part C of WTC 1 full of air) on a similar but slightly stronger structure below (lower part A of WTC 1 - another bird cage?) and apply 57 J per kilogram, then one can be certain that only the delicate structure below (i.e. lower part A) will be fractured & crushed, while the even weaker structure above (i.e. top part C) remains intact. In fact top part C will just bounce on bottom lower part A as A and C can easily absorb >5 700 J/kg as elastic deformations. Bazant & Co are only supported by such idiots that are also found at NIST. Plenty of crazy people around! Actually you need about 2 000 times more energy per kilogram structure to crush the structure in the WTC 1 collision or any structure and it cannot be applied by gravity from above! So in reality only 1/1 000th of both parts C and A would have been damaged at the collision on 911 and then top part C would have rested on top of lower part A! It happens in any collision between two multi components/members/joints structural parts C and A! Both parts C and A get their components in contact locally damaged and no rubble B is formed. It is easy to verify in any laboratory. Drop any C on A (same structure and C< A) and C always comes to rest on top of A. No gravity driven collapse of a structure from top down is possible under any circumstances. The 911 terrorists overlooked that simple fact! But they seem to be supported by US authorities, agencies (NIST) and professors! It is sad to conclude that the Bazant & Co Closure is as useless as the original paper. It actually confirms that Bazant & Co have a hidden agenda with its false information. What can it be? To support terrorism! However, I like the last sentence of the Bazant & Co Closure: "This gives for the rubble pile a slope of about 20°, which agrees well with the typical slope of rubble piles seen in the demolitions of buildings". Yes - the rubble pile really looks as if the building was demolished by some planned means. If you disagree with above and can describe a structure or building that collapses from top down, top C crushes bottom part A into a rubble pile B using say 57 or 579 J/kg, you can win Euro 1 000 000:- by participating in the Heiwa Challenge! A structure A top C of which crushes A in a gravity collapse is described here - it is suggested that "progressive collapse, when wrought, is quite ordinary and regular and not due to extraordinary, possibly conspiratorial, influences". It seems very simple ... because the description is 100% nonsense based on Bazant's early falsifications ... and does not work in reality. The false suggestion by K.A. Seffen is that - the instability (to create a gravity collapse of a structure) is formed by the dynamical overloading of the storey immediately below the weakened columns, i.e. the uppermost elements of part A is dynamically overloaded by contact of top part C. However, top part C (a small part of A) cannot apply sufficent energy (and pressure) on part A below under any conditions to initiate and maintain further destruction of A. It really is a simple as that. I do not wonder why K. A. Seffen (kas14@cam.ac.uk) hasn't collected Euro 1 000 000:- in the Heiwa Challenge ! He is another loser!